Fanta Aw, Kogod ’90, SPA/MA ’94, CAS/PhD ’11, at the 2016 Celebration of Scholarships. Photo by Jeff Watts. Each spring, American University pauses to honor the achievements of our students and the powerful investment that scholarship donors have made in their future. On March 16, 200 students, donors, faculty, and AU leadership gathered for this purpose at the 19th annual Celebration of Scholarships Luncheon. This year's program featured a three-time alumna donor, a student who made his way to Washington from a tiny island, and an operatic example of philanthropy in action. 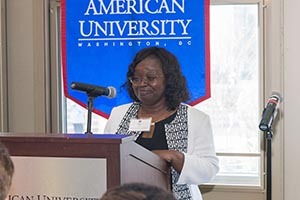 Fanta Aw, Kogod '90, SPA/MA '94, CAS/PhD '11, assistant vice president of Campus Life and Hurst Senior Professorial Lecturer, has a deep connection to scholarships at AU - professionally, she works closely on the administration of scholarships, and personally, she philanthropically supports a number of these funds. Dr. Aw was recognized for her tremendous commitment to helping students embrace life at AU while ensuring they have the scholarship support they need. She feels strongly that "scholarships mean opening doors of opportunities for students to leverage the full AU experience." "For a boy born and raised on an island 21 miles long and 7 miles wide in the Bahamas, being here [at AU] has been an eye opening experience. I have had the ability to immerse myself in different cultures, expand my understanding of worldly issues, and debate various political views and ideologies." Toby credits philanthropy as the critical key that allowed him to attend AU. He remarked to the crowd, "the only way I have been able to enjoy all the rights and privileges of being an American University student… is through the generous help from you, the donors." Dr. Aw shared, "when we support scholarship programs, we are investing in our collective future and ensuring that students with great promise are able to live out their full potential." Following the impassioned remarks, Charlotte Bergmann, SOC '16, performed the aria "Lilacs" of the opus 21 set composed by Segei Rachmaninov in 1902. She has been a member of the AU Chamber Singers since the fall of 2012 and is the recipient of the Margery Kraus Scholarship for the Study of Global Communications and Public Affairs, as well as the Music Scholarship. Scholarships at AU open doors to new experiences, greater opportunities, and freedom to pursue passions. They forever change their recipients, allowing students to grow in ways they may have believed to be impossible before. The effect scholarships make in the lives of AU students ripples through their families, their communities, and the world. Scholarship funds provide resources that help change the lives of AU students, making tuition assistance available based on both need and merit. The annual Celebration of Scholarships luncheon brings together recipients of donor-funded scholarships and their donors to express gratitude for their generosity.